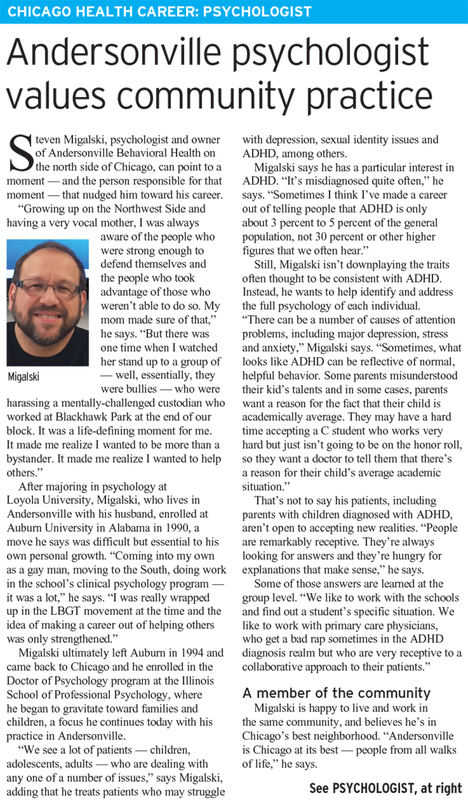 Dr. Migalski discusses his reasons to pursue a career in clinical psychology, the role his practice plays in the community, and his efforts to help correct the over diagnosis of ADHD in both adolescents and adults. Dr. Migalski discussed reasons for the trend of the over diagnosis of ADHD and related disorders in children and teens with WGN’s Hannah Stanley. He also discussed strategies parents may use to help ensure their child’s is correct. Dr. Migalski shared his thoughts and concerns on the pharmaceutical industry’s role in the DSM-V adding new mental disorders without much research. Does the DSM-5 stigmatize human behaviors and emotions (again)? Dr. Migalski discusses how changes in the DSM-V haave disenfranchised his patients with Asperger’s, a disorder no longer listed in the manual. He also discusses his approach in showing compassion and respect while explaining how changes in the DSM-V will affect patients’ day-to-day lives. Celebrating 20 years of clinical service! © 2000-2016 Dr. Steven Migalski; All Rights Reserved. No part of this website may be reproduced without written consent.